When the nation’s best track and field athletes descended on Eugene for the chance to represent the United States at the Rio Olympics, an army of reporters and photographers were there to document every sprint, leap, and throw. 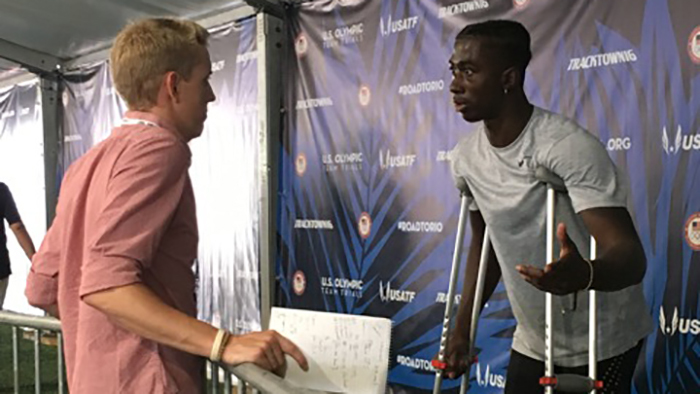 Among the throng of media covering the U.S. Olympic Trials were eight students from the UO’s School of Journalism and Communication, who worked long hours covering each day’s top stories. Working under tight deadline pressure, the students published eighty-four stories in eleven days, forty on the class blog, and forty-four for professional publications, including the Arizona Republic, Seattle Times, Tampa Bay Times, and St. Louis Post-Dispatch. “It was very intense,” said Isaac Gibson, a junior majoring in journalism in the SOJC. “I’ve never written as fast as I did” during the Trials. 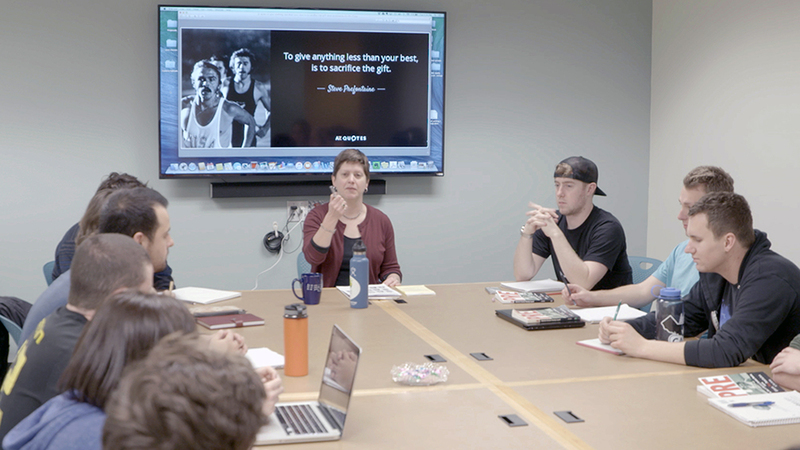 The students were enrolled in Advanced Sports Reporting, a class taught by Lori Shontz, a former newspaper and magazine reporter and editor who teaches reporting and sports journalism, among other courses, in the SOJC. Shontz covered four Olympic Games as a reporter and coordinated coverage as an editor for two others. To get into the Trials class, students had to take a sports reporting class during spring term, which involved covering collegiate meets at Hayward Field, as well as work in the classroom. What the students learned is that covering a track meet involves more than just showing up, taking notes, and filing a story about who won the race, Shontz said. They read about such Oregon track luminaries as Steve Prefontaine and Bill Bowerman, and heard from track coaches and athletes about what it’s like to train for a major event. They learned that athletes don’t necessarily care about slow race times in the middle of the season because they’re building toward bigger goals later on. And they learned why track and field is so important to the culture of Eugene. Shontz acted as editor and bureau chief, doling out assignments, editing the writers’ copy, and reaching out to publications to publish the stories. She said the class wouldn’t have been possible without support from within SOJC, as well as from TrackTown USA (the Trials’ local organizing committee) and USA Track and Field. While the students were well prepared with background research, they still had to hone another skill in real time: punching out a story under a tight deadline, something that can’t be simulated in a classroom. “The analogy I always use is, you can’t simulate being on the free throw line with your team down by two points and 20,000 fans screaming at you,” she said. “Until you’re in that pressure situation, you don’t know what you’re going to do. “The beauty of taking students out of the classroom and putting them in a professional media tent and professional situation is they had to respond, and they did,” she said. Gibson said Shontz’s leadership helped prevent students from stressing out too much while on deadline. Gibson covered track meets at Hayward Field during the spring season, but that experience was nothing like the Trials. Students typically had an hour to crank out a story, sometimes less. “I’ve never had deadlines quite like we did during the Trials,” he said. Gibson had stories published in the Arizona Republic, the Lewiston (Maine) Sun-Journal, and the Santa Cruz Sentinel that focused on local athletes. In addition to bylines, he also got paid. “We joked Lori was more our agent than our teacher,” Gibson said. For Gibson, who ran track in high school in San Antonio, Texas, covering the Trials changed his professional aspirations. Going in, he was studying journalism to improve his writing skills for a career in the law, he said.